3 days. 3 days until we’re sitting on an airplane headed to America-land. 3 days of blur. The past few weeks have flown by in a flurry of editing and technical-publishing-learning-as-I-go-blah-blah and food photography and art direction. It will continue up until the moment we leave, and quite possibly for a bit while we are away, and as a result the impending holiday is proving a bit more laced with stress than anticipation. Rush rush rush, stay calm but rush. “Tick one thing off before starting the next”, I tell myself while trying to remember to breathe. Multitasking – the dreaded ‘m’ word – is bantered about as a finely tuned skill, and while it tends to be my default go-to state I’ve realised over the years that it is not only the most unproductive way to work but quite possibly a thinly veiled excuse for stunning displays of ADD. I fought my urge to multitask this morning while making granola. Granola is like grilled cheese, you simply can’t rush it. Ever tried to crank the heat to cook a grilled cheese faster? Burnt bread and cold cheese is all the thanks you’ll get for that one; granola falls into the same camp. I’m guessing you want crunchy and golden, not charred and smokey so be patient, take your time and for goodness sakes don’t try to multitask. 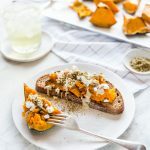 Last week I mentioned the whole list situation and so it came to pass that this month’s Secret Recipe Club assignment – K&K Test Kitchen – was immediately explored, then firmly transferred from one list to another as the days ticked by. It’s not that I couldn’t find anything to make – it’s simply that there were so many wonderful things to choose from! 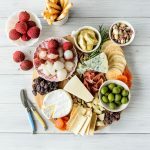 A collaboration between daughter – Kelsey, and mom – Kim, K&K Test Kitchen is bright and cheery and has an overflowing recipe index deserving of a cup of tea and an uninterrupted block of time to explore. In the absence of any time to explore properly, I went with my gut. And my gut was inspired by Peanut Butter Granola. ~ Stop multitasking, even if only now and then. ~ Don’t rush grilled cheese. ~ Trust your gut, especially when it comes to granola. And finally, as long as you remember to pack a passport everything will be ok (note to self, pack passport…). Preheat oven to 165C [325F]. Line two baking trays with parchment (baking) paper. Combine dry ingredients, oats through coconut, in a large bowl. Gently heat macadamia butter through spices in a small pan, stirring until smooth. Pour wet ingredients over dry and quickly stir to coat well. Spread onto prepared pans and bake for 10 mins. Stir, pulling edges into centre and vice-versa, and bake a further 5 mins. Stir and bake 3 mins, then check at 2 min intervals. See testing note below. Testing: after granola has been in the oven for 15 mins remove a spoonful and let it cool as the mixture continues baking. If the spoonful crisps up, remove trays from oven. If it’s still soft give granola another 2 mins then test again. It can go from golden to charred very quickly! Nuts and nut butter: if macadamias aren’t for you replace the nuts and nut-butter with almond, cashew or even peanut. For a nut-free version go for all seeds and a seed-butter. Fruit: add chopped Turkish or Greek figs, dry cranberries or inca berries, or dry apples for a sweet treat with an extra hit of fiber. Fruits include fructose. 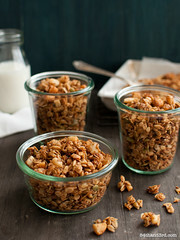 I chose Granola for my SRC recipe this month too!!! I am going to have to try this one also!! That looks wonderful! Great SRC pick! My mouth is watering – that looks absolutely fantastic. Great SRC pick!! What a delicious combination! Happy reveal day! Oh brilliant, another sugar-free granola for me to try out! Great post and have a wonderful trip JJ! 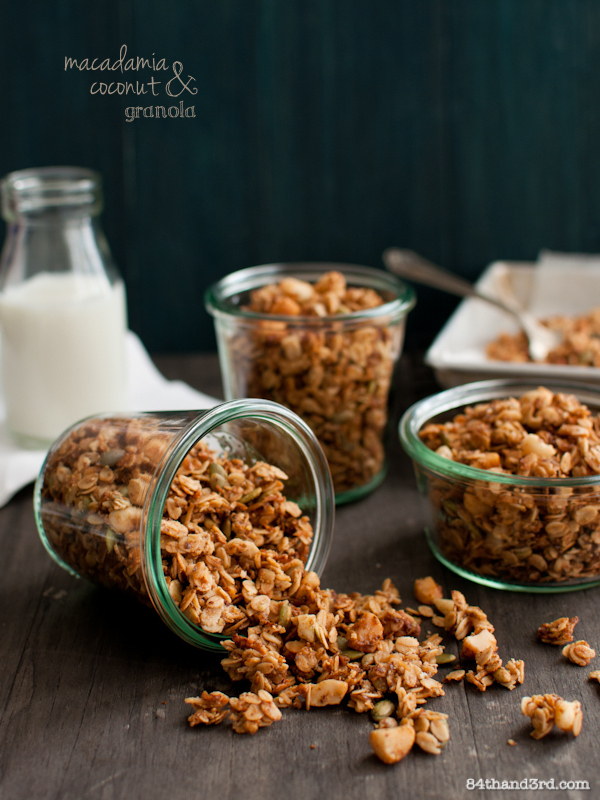 What a great granola recipe! I love granola and will have to try it. This looks so delicious! Great SRC pick! 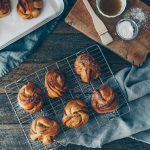 Great breakfast recipe! That sounds like a great flavor combination! I love this variation on the PB granola recipe. 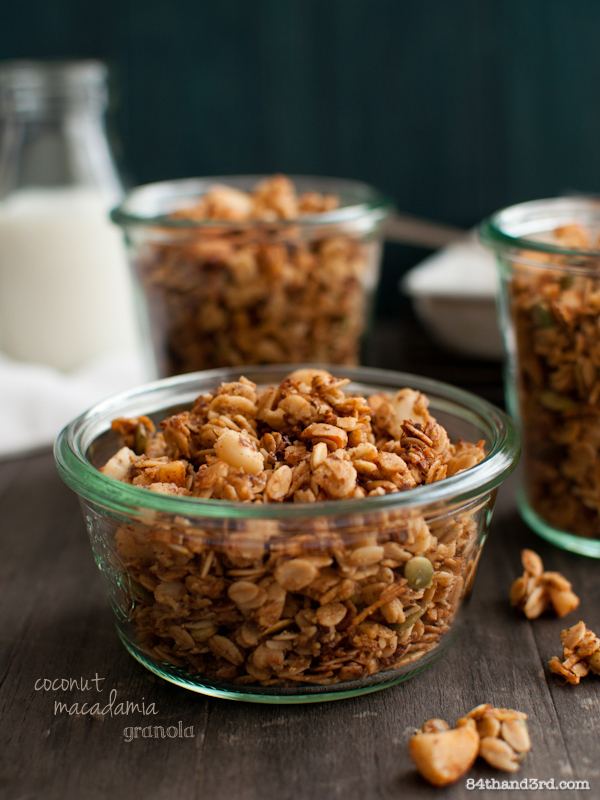 Lately I have been craving anything coconut, so I will have to try this version for my next batch of granola. Thanks for stopping by our blog this month! 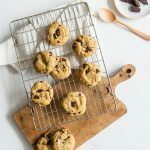 I love coconut macadamia ANYTHING, so this recipe is definitely calling my name. YUM!! Granola is my favorite travel food. Great for snacking and when breakfast doesn’t pan out. Lovely pick! Granola is the PERFECT travel food!! Great choice to share with us 🙂 Your photos are beautiful!! 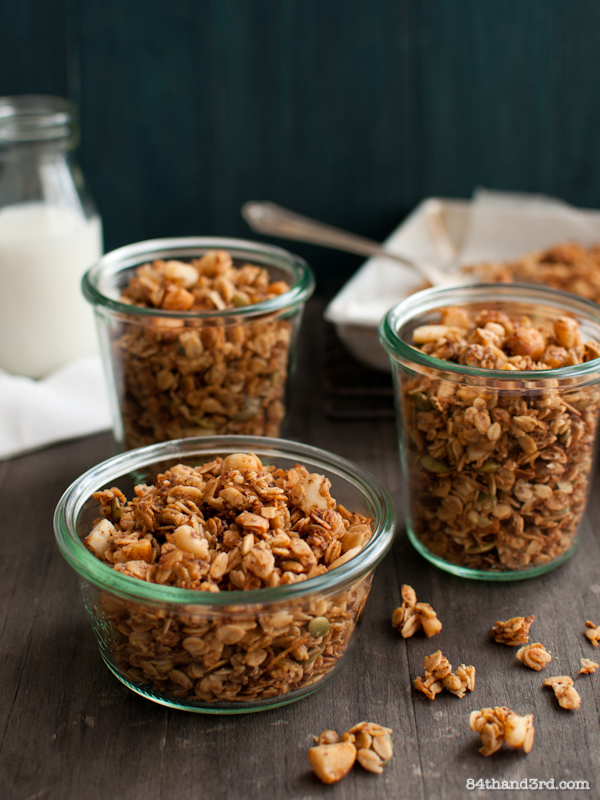 Granola is great for breakfast and an awesome snack too! Yours look yummy! Great SRC pick! You had me at Macadamia. I can’t wait to try this! Yes, breath…have a great trip and let’s make some of this. 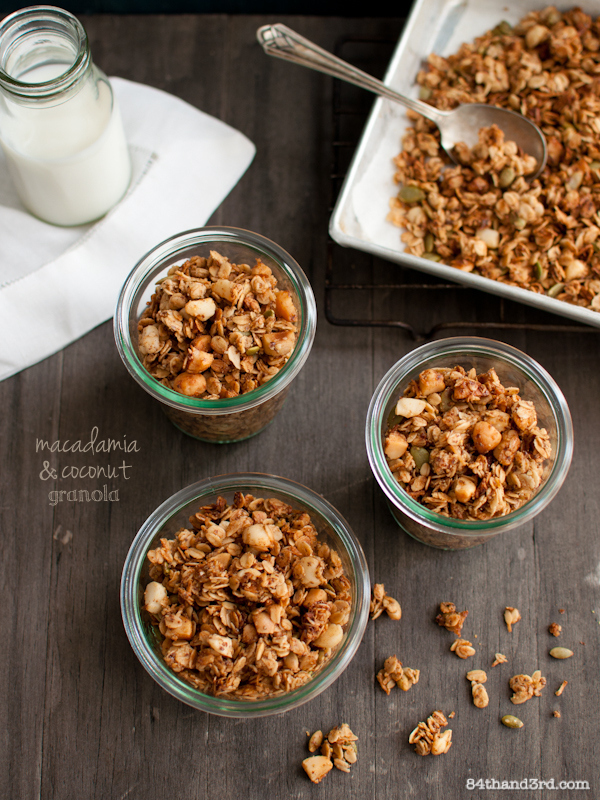 Fab granola, I love the macadamia and coconut! Hope you have a wonderful trip! This looks wonderful and totally agree with the don’t rush it. I’ve tried. Doesn’t work. Homemade granola is the best. I like the sound of peanut butter granola as I love peanut butter. Also love macadamia. Your pictures look so good I wish I could have some now. Great SRC pick. Have a brilliant holiday! 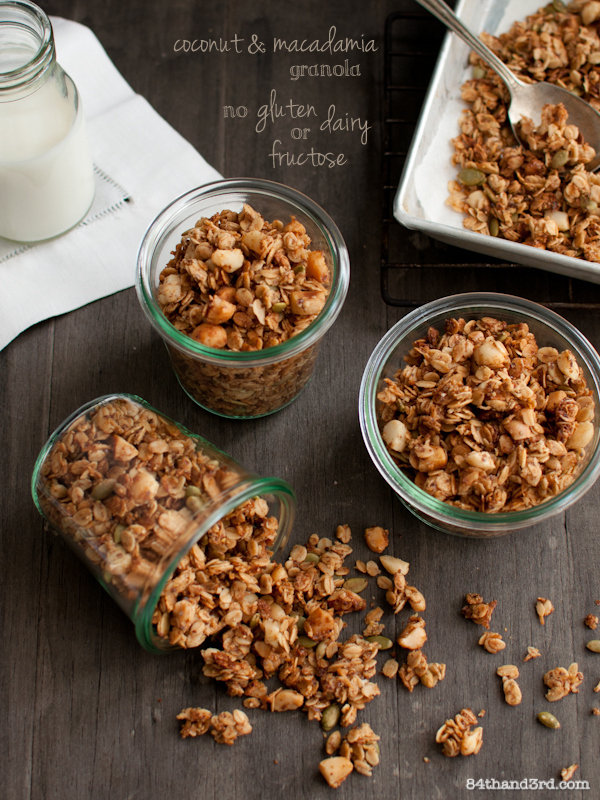 And I love the granola – I’m trying to eat more nuts and coconut so I’ll definitely make a version of this.